Today’s prompt is to share something about me that isn’t related to yarn and fiber. I first wrote the essay below more than 15 years ago. I didn’t write it as part of an assignment or for publication. It just came to my head and I wrote it down. I lost the document for a while, but 10 years ago, I stumbled across it and updated it with my experiences with libraries here in Florida. I’ve edited it again for publication here. My parents always thought reading was important. They started reading books to us when we were infants. Throughout my childhood, we had a bedtime ritual of a parent reading a chapter aloud to us. Sometimes, when my father was working late, he would come rushing in the door, hoping he hadn’t missed this opportunity for us to all gather together as a family with a book. I suppose most of the books were library books, because we couldn’t afford to buy many books. Some of my earliest memories are about the library. We lived in a townhouse for about 18 months, moving in when I was 2 and out a couple months after I turned four. The town we lived in had a Bookmobile — an RV whose interior had been turned into a library. Floor to ceiling bookshelves lined the walls and it visited our townhouse community weekly. I have a very clear memory of the inside of that Bookmobile. One day, I somehow snuck in there by myself. The driver / librarian didn’t know I was in there, and my mother didn’t know where I’d gone. I remember hearing her outside, calling my name repeatedly. I was tucked way into the back, lying on the floor, basking in the presence of the books. I felt completely relaxed and at home, and I didn’t want to leave. Eventually my mother and the driver found me. I remember the stunned look of the driver. He truly had no idea I was there, and was about to drive off to his next stop. I have no recollection of my mother’s reaction. In the brick and mortar library in that same town, the rule was that to get a library card, you had to be able to write your name on the card. I clearly remember the day I got my first library card. I was so small (pre-kindergarten), that I had to stand on tiptoes and stretch up to reach the desk, even though it was a regular height desk, shorter than a dining room table. I remember the librarians, although their names have faded from my memory. I remember the children’s room clearly. An abundance of natural light streamed in through the high windows; colorful milk crates served as bookshelves; librarians performed puppet shows during children’s programs. Behind the curtain of the puppet stage, there were toys freely available for any child to play with during their library visit. I remember the exact location of the shelves holding my favorite books (the Little Miss and Mr. books). This week, my trip includes staying for a couple of days in that same town. I plan to pay a visit to the library and see how much it has changed in the 30 years since I last lived there. 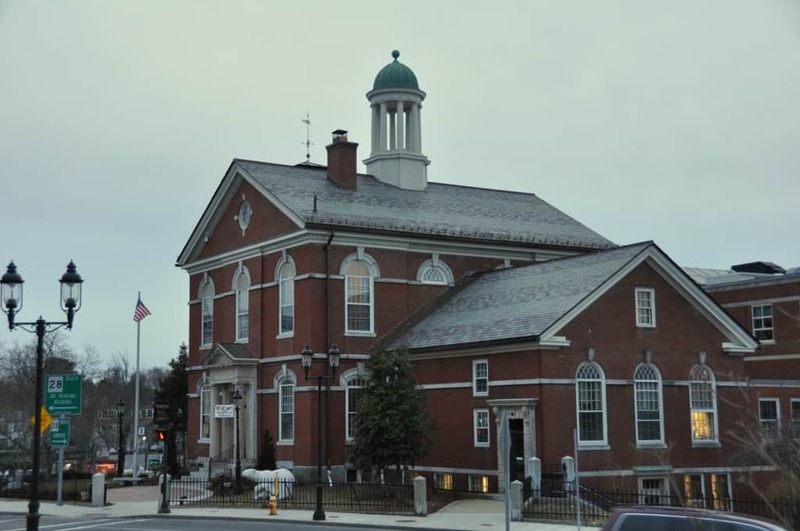 This picture of the Russell Library in Middletown, CT is taken from the library’s website. The exterior is exactly as I remember it! When I was about 9 years old, we went on a camping vacation with family friends to upstate New York. One drizzly afternoon, we wandered into the public library and curled up with books for a while. The library was a small, brownstone building and was rather dark inside. I bought a book from their sale table that day, which is still on my shelves. I always forget which book it is, until I open it and the smell of the pages instantly transports me to that day. When we moved to the Boston area from Connecticut, I was in 6th grade. My mother started working full-time, as our expenses tripled with the move. But we were walking distance to the school. The library was only about a mile away, with good sidewalks the entire way, so we could walk there as well, although we could not walk home with our full bags of books! In that library, I discovered the 800 section of the Dewey Decimal system, home of the Classics. I decided to read my way through them and on my own initiative read Romeo and Juliet and The Sun Also Rises, which I did not even begin to understand and which I never finished. 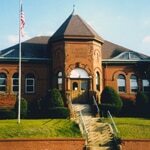 The Stoneham Public Library, where I planned to read all the 800s. Photo from Stoneham.gov. The next year, we moved about 25 miles north, out of an apartment and into a house. The library at the new place was downtown, and not really in a nice place, although the library itself was large and modern. Due to its location, we never used that library. Instead, we traveled one town over. This library building was an old brick building with columns by the front door. It was older and smaller than the library in our town, but prettier and safer. A few years later, the town totally renovated and expanded the building. 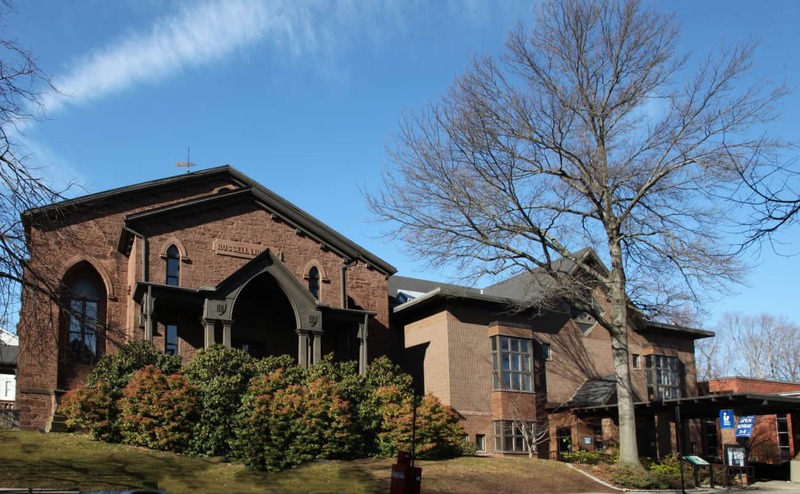 Since the original building was in the middle of downtown and on a steep hill, there was not much room for expansion so the extension was built into the hill behind the original structure. When coming in from the parking lot, you faced a 4 story staircase. The elevators were hidden behind the staircase. The desk for returning and checking out books was at the peak of the staircase. My sister and I never wanted to take the elevator, but we always had a lot of books. During the summer, we went to the library once a week. Usually we checked out about 20 books each (and we actually did finish nearly every book we checked out individually and sometimes read books the other had chosen as well). We had this big ski bag that we would stuff full of books. It would be so heavy we could not carry it, unless we each took a handle and carried it together. We would travel up and down the staircase with the bag swinging between us and we each usually had another bag on our side. This created a traffic jam for anyone else attempting to traverse the staircase. Of course, the librarians knew us. We were there every week and checking out a LOT of books. Once, a new librarian told us we could not check out so many books at one time, but one of the other librarians came to our rescue and told her it was okay, we did this all the time and were rarely delinquent returning books and yes, we really did read them all. This library had a reference desk you could call and ask any question. Perhaps all libraries offer this service, but I have never used it anywhere else. I still remember the answer to the question I asked them – how many cups are there in a 5 pound bag of sugar and a 5 pound bag of flour? When I moved out of my parents’ home as an adult, I did not have a car, but fortunately had very good public transportation access to the library. At first, I went to the library in my town, but as I worked in downtown Boston, I often went to the Boston Public Library. If I was quick, I had enough time on my one hour lunch break to hop on the T, run over to the library, return some books and get a few more, hop back on the T to make it back to work on time. On other occasions, when I wanted a more leisurely experience, I would go after work. I frequently went to the Boston Public Library in the evening to hear authors read from their work. 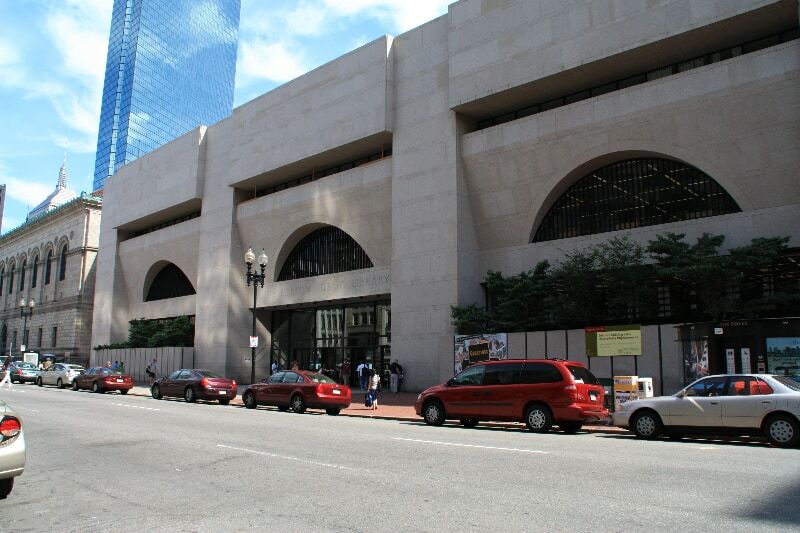 The Central Branch of the Boston Public Library is comprised of two buildings. The modern building on the right here is the Johnson building. It is the main entrance to the library; the Boston Marathon ends just outside its doors. The historic McKim building is on the left. The library conducts tours of the art and architecture in the McKim. Photo Courtesy of Boston Public Library. 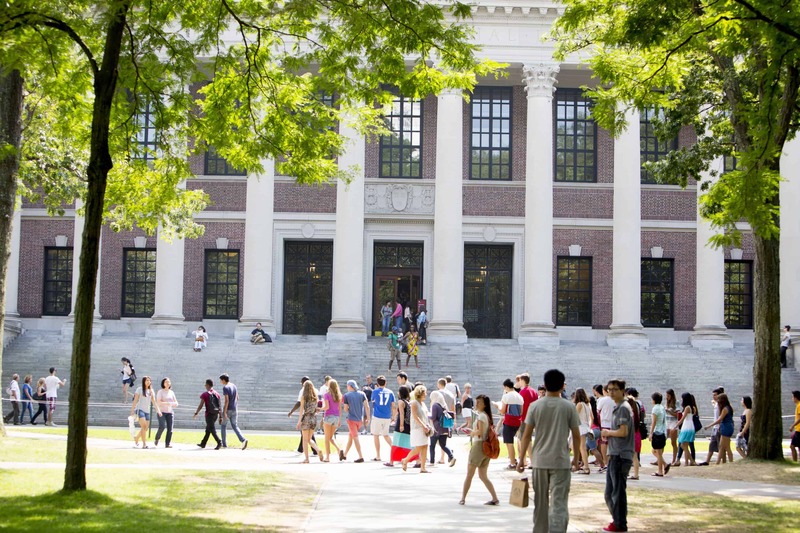 During this time, I was also a student at Harvard University and had access to their world-class library system. Harvard has more than 90 libraries in their system, but I only used 6 of them. Accessing the Harvard libraries is a religious experience for a book and library lover. The main library, the Widener, looks to me like a Greek or Roman Temple, with its many shallow stairs leading up to the entrance and all the pillars at the front of the building. Inside, it is decidedly more mundane. The linoleum floor tiles in many parts of the library are cracked or missing. Since it is so large, and many parts are not necessarily needed by patrons at this precise moment, large sections of the library are dark and you flip the light switches on yourself as you enter the area. The steps of Widener Library at Harvard University. Rose Lincoln/Harvard Staff Photographer. Photo courtesy of Harvard Public Affairs & Communications. From the Widener Library, you can walk through underground tunnels into two of the other near-by libraries. The first library you reach through the tunnel is a library which is entirely underground. To get to it, you walk through a utility tunnel with all these exposed pipes running along the wall. The first time I walked this tunnel, I thought I would get lost or be locked out on the other end or perhaps I was somewhere I was not supposed to be. But I arrived at the attached library without incident. The Widener Library has shelves which are pushed up right against each other. In order to use an aisle, you pushed a button and all the shelves moved on tracks to create an aisle where you needed one. You then had to press a button to lock the opening. I was always paranoid that I would forget to lock the opening and another student would open an aisle far down the line, not knowing I was there, and my aisle would close on me. I always checked several times to be sure I had locked my row open and scanned the aisle for empty sections of shelves down low, so I could squeeze myself in somewhere in case the aisle closed on me. I loved the libraries for the Divinity School and the Medical School. In my mind, it seems to always be fall as I approach the Divinity School Library, although I used it for an entire year. The orange and yellow leaves litter the path as I walk up to the door. The Countway Medical Library is not on the main Harvard Campus in Cambridge, but a couple of miles away, across the Charles River in the Hospital District of Boston. This library is walking distance to Fenway Park, the Isabella Stewart Gardner Museum, and the Museum of Fine Arts. All of the Harvard Libraries require that you show a Student ID and they search your bags as you enter and leave the buildings. But the Countway Library did not seem as cursory in their security inspection. I had to actually leave an ID with them to pick up on my way out of the library, and I had to tell them how long I planned to be there and what resources I was planning to access and what class I was taking before I was allowed into the stacks. (NOTE: I was a student at Harvard in the late 1990s, before the September 11 bombings of the World Trade Center Buildings. I’m sure security procedures have changed in the intervening years). After graduating, I again started to use the public library in my town. There were two branches. The main branch was nearly a mile away, but the other was right around the corner. Every day, as I got off the bus on my way home from work, I faced the library. This branch was not open in the evening, so I would go on Saturday afternoon. It was an old building, not air-conditioned and everything was still done by hand. It still had an actual card catalog, not computers, and in the back of each book was a card that the librarian marked the card number of the patron and the date the book was checked out. A separate card was kept at the desk with each patron’s name and a list of the books currently checked out to their card. Sometimes, I would select a book from the shelf for the sole purpose of seeing how often it had been checked out by someone. I always entered this library by the back door, as it was the first door I came to when walking there. This door was kept locked, and I would have to knock on the door to gain admittance. My husband and I moved to the Orlando, Florida area in 2002. We drove from Massachusetts, with a CRV full of clothes, fragile items, and two cats. After 27 hours of straight driving, we arrived late on a Saturday afternoon, got our key for the new apartment and collapsed on the floor to sleep. On Sunday afternoon, I got my library card. Our furniture did not arrive until Thursday, but at least I had access to books! 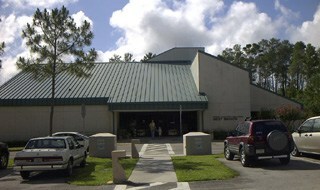 The library I use now is small, but it is part of a decent county-wide system. These days, I spend little time perusing the aisles. Instead, I go to the library’s website, use the online database to see if they have the books I want, and place a hold. The librarians pull the books, send the book to my local branch and e-mail me when they are ready for me to pick up. If the county library system does not have the book, I can also fill out an online form to request the book through interlibrary loan. When the book arrives from interlibrary loan, I get an e-mail. I never used interlibrary loan much before I could make the request so easily, but now I do rather often. I have received one book from a library in New Mexico! (I wrote this paragraph 10 years ago, 3 years after moving to Florida. The County has since discontinued the interlibrary loan program because of the cost of running it.) These days, the library is more of an errand than a place to lounge. All I have to do is stop at the desk, drop off the returns and hand over my library card to procure the waiting volumes. Our house is only a mile from the library, so it is easy to stop there on my way home from errands. Every library I have used has enriched my life. No matter what my circumstances have been, the library was always there with its resources freely available for my use and pleasure. Libraries still imbue me with a sense of awe; all the knowledge of the world, printed on pieces of paper, and available for free. This is impossibly generous and I am so grateful to have access to such amazing riches. 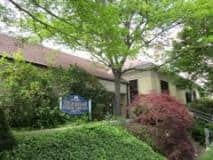 I have great memories about my local library from when I was a child. In the summer holidays they used to offer a “book worm trail” where you earned stickers for every book you read in a passport. Great fun! Sadly at lot of local libraries are lacking a bit nowadays around where I live where funds given by the council are low and people aren’t using them because books are so cheap to buy. But we should all support our local libraries – it would be such a shame if they died out! This is such a great story! It sounds quite a bit like me growing up- though I only had one library, in one town. Fond memories are inspired by this post. Thanks for sharing. I just love your post! Libraries are so special. Imagine my surprise to see my local library among the photos you posted. I have some wonderful memories from times spent in that library. What a wonderful story! it is so great that libraries played such an important part in your life. I love that Russell library pic – so archetypal. As a kid I walked to my library almost every day…as an adult, I rarely use it…I buy my books instead….but I keep saying, I need to use the library more.. Libraries are just so magical places… I’d love to expolre this underground one you describes one day, that sounds pretty awesome! Loved the library pictures and stories–had me thinking particularly of my childhood library. We lived in the same town from third grade until my parents retired and moved from northern Maine to central Maine. The library was at most a mile’s walk, so I went whenever I felt like it–in those days, it was safe to walk across town and children were expected to walk! I remember buying Nancy Drew and Hardy Boys books for 50 cents each, and going to the library for everything else. I read my way thru the children’s books in the basement by the time I was in the 4th or 5th grade, so the children’s librarian suggested a few things she thought I would like from the upper levels. One of the librarians in the upper levels was a grouch (politest word I can think of) and didn’t want children touching her books, so the children’s librarian had to personally vouch for me. In graduate school I remember the joy of wandering the stacks and perusing a journal that was new to me; nowadays everything is online and you have to physically drive to the college or be taking a class to read journal articles online. It’s just not the same….